Bessie Coleman, known as "Queen Bess" (January 26, 1892 - April 30, 1926) was the first African American woman to become an airplane pilot. She was also the first black licensed pilot in the world. Ms. Coleman was married briefly to Charles Wilson Pankey. Bessie ColemanBorn in Atlanta, Texas, Coleman was the twelfth of thirteen children. Her father was three-quarter Choctaw Indian. The family earned their living by picking cotton. Everyone worked, including the children. The elementary school that she attended very often lacked such materials as chalk and pencils. Nevertheless, Coleman graduated from eighth grade and briefly attended college at Colored Agricultural and Normal University, Oklahoma (now Langton University) until her funds ran out. Coleman knew there was no future for her in her home town, so she moved to Chicago where she joined two of her brothers when she was 23. She worked at a supermarket there with her brothers. She also worked at the White Sox Barber Shop as a manicurist. There she heard tales of the world from pilots who were returning home from World War I. They told stories about flying in the war and Coleman started to fantasize about being a pilot. Her brother used to tease her by commenting that French women were better than African-American women because French women were pilots already. At the barbershop, Coleman meet many influential men from the black community, including Robert S. Abbott, founder and publisher of the Chicago Defender, and Jesse Binga, a real estate promoter. Coleman received financial backing from Binga, and from the Chicago Defender, who capitalized on her flamboyant personality and her beauty to promote his newspaper, and to promote her cause. Coleman took French language class at the Berlitz school in Chicago, and then travelled to Paris on November 20, 1920. She could not gain admission to American flight schools because she was black and a woman. Coleman was the only non-white student at her French flight school, and she learned while using a plane that had failed many times. Once, she saw a fellow student die during practice. However, she learned quickly: in seven months, she was granted a pilot license. In September of 1921, she became a media sensation when she returned to the United States. Invited to important events and often interviewed by newspapers, she was admired by both blacks and whites. In 1922, she participated at her first airshow, in Long Island. Coleman continued to perform in airshows, and survived several crashes. In Los Angeles, California, she broke a leg and three ribs when her plane stalled and crashed on February 22, 1922. As her notoriety grew, she was invited to make a film about her life. Ultimately, she walked off the set because she felt the script stereotyped blacks. Her ultimate aim was to improve the lot of African Americans by opening a flight school they would be able to attend, as American flight schools were closed to them. On April 30, 1926, Coleman was preparing for an airshow, with her mechanic, William Wills, at the controls. The plane was an old, unsafe, cobbled-together wreck. Her friends and family did not consider the aircraft safe and implored her not to fly it. Coleman did not put on her seatbelt, because she was planning a parachute jump and wanted to examine the terrain. The plane crashed, possibly because of a wrench that got stuck in the control gears. Coleman was killed instantly. Wills also died. Neither was using a parachute. Her funeral was attended by 10,000 mourners. Many of them, including Ida B. Wells, were prominent members of Black society. 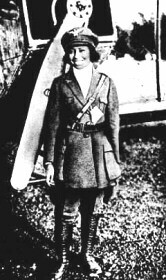 As the first African American woman pilot, she has been honored in several ways since her death: in 1931, a group of Black male pilots performed the first yearly fly-by over Coleman's grave, in 1977, a group of African American women pilots established the Bessie Coleman Aviators Club and in 1995, she was honored with her image on a postage stamp by the United States Postal Service.